The Boesmanskloof Trail winds through the only gap in the rugged Riviersonderend mountain range. It is in the Robertson Karoo region of the south-western Cape. The trail links the small towns of McGregor in the north to Greyton in the south. 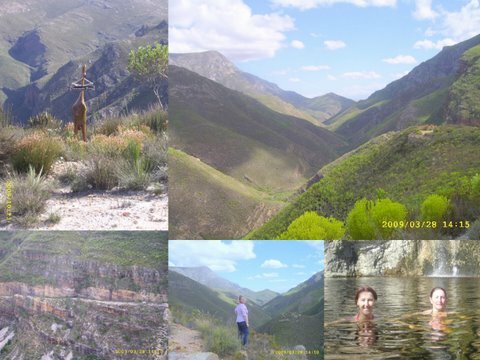 It has become on of the most popular trails in the Western Cape, especially as the beautiful colonial-style town of Greyton lies at the one end. The length of the trail is approximately 15,8 km and may be hiked within one day. It can be started from either McGregor or Greyton . While the trail lies just outside Greyton , it only commences 14 km to the south of McGregor at Die Galg . Boesmanskloof Accommodation right at the end/start of the trail on the Mc Gregor side. http://www.boesmanskloof-diegalg.co.za. Barry Oosthuizen-0236251794 or 0722400498. R80 per person own bedding. R110 per person with bedding and towels. Boesmanskloof Hikingtrail Accommodation on the Mc Gregor side.